The X-Trail is Nissan’s not contribution to the lifestyle SUV market. The introduction of the X-Trail was very significant and gave Nissan a viable competitor in this sector. Nissan studied the competition very carefully and was able to design a vehicle that catered to the wants and needs of buyers. The vehicle does not deliver an exciting package, but it does deliver a vehicle that is very good at what it was designed to do. The Nissan X-Trail provides plenty of cabin space, an attractive exterior design, and engines powerful enough to handle some really challenging driving. The Nissan was designed to function mainly on the road and in more urban areas. The Nissan X-Trail is a soft roader. The X-Trail’s modern looks and updated, interior design blows away rival brands. The car’s standard package includes high levels of fit and finish. On the road the X-Trail tends to drive like a car. Acceleration is rapid, and it handles mud and gravel without too much difficulty. The X-Trail offers a really good on-road ride, this is sure to be a favorite among families. Though image conscious families are more likely to buy a car with a more stylish badge. The X-Trail is not the least expensive car to buy, but Nissan includes a high level of standard specification and makes the car good value for the money. The car also enjoys a high resale value. 2.5-litre and 2.2 –litre diesel engine are both very good choices. The diesel engines also have a longer service interval than the petrol engines. The cabin is spacious with excellent storage cubbies. The car’s luggage area is large and comes in very handy. The car provides adequate space for storage and comfort. The car’s controls and dials are functional but far from impressive. They are large enough but lack an attractive appearance. The car’s sat-nav system on the other hand is very impressive. The car provides plenty of cabin space and storage space for comfort. The car’s seats are supportive and reasonably comfortable. The front seats adjust for comfort. The car requires passengers to step up in order to gain access to the cabin. This may pose problems for some passengers. The boot provides good access but the door is fairly heavy. The X-Trail provides a high driving position but the vehicle’s large size makes it difficult to park. The X-Trail is a challenging car to park even for more experienced drivers. The car feels really spunky and fast for a vehicle of its size. The car’s all wheel drive capabilities come in very handy for adverse weather conditions, and the X-Trail will not easily disappoint. The X-Trail doesn’t necessarily target families, but could do a more than adequate job transporting families. The cabin is spacious and provides decent levels of comfort. A family might appreciate the X-Trails durability and would definitely appreciate the X-Trails boot space. This is not the vehicle for new drivers. The car is too big and difficult to navigate. The car’s off-roading abilities are not suitable for novice drivers, and the car’s all-wheel drive feature may not be good for drivers to learn proper driving techniques. Nissan used to be viewed mainly as a value-for-money producer, but in recent years the firm has managed to produce a diverse array of value for money cars and quality build purchases as well. The company has a good reputation for reliability, durability, and dependability across the board. X-Trails come with an impressive security package. As standard the vehicle comes equipped with a Thatcham category 1 alarm with sensors, an engine immobiliser, and superlocking with an anti-hijack feature. The X-Trail is a favorite target for car thieves and will need a comprehensive security package. The car’s safety package includes ESP, ABS and four-wheel drive. Twin front airbags, head and side airbags are standard on all models, Isofix child seat mountings are also included. The X-Trail comes standard with a single-disc CD radio unit. Sport and SVE models include an in-dash six-CD player and a cassette player. The T-Spec model comes with even more upgrades. The car comes standard with driver’s seat height adjustment, front and rear electric windows, electric door mirrors and climate control. Higher level models receive higher levels of standard specification. The T-Spec version comes with state of the art electronic gadgets. 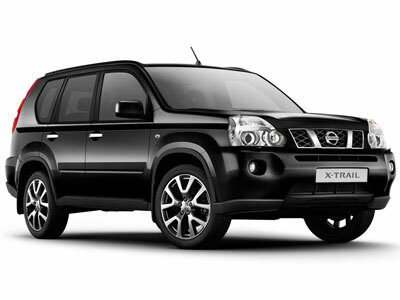 The X-Trail is an extremely stylish and attractive vehicle. The car is reliable and delivers decent fuel economy. The car is extremely competent and comes with a good standard package. There are also enough cost options available to meet the needs of most buyers. This entry was posted on Thursday, August 7th, 2014 at 12:06 pm by admin and is filed under Uncategorized. You can follow any responses to this entry through the RSS 2.0 feed. Both comments and pings are currently closed.